This is a late review - this was actually released a couple of weeks ago, but I only got to go through it yesterday. By coincidence I got to read this directly after The Walking Dead #58, and so, while maybe a bit unfair, I did make a comparison between the 2 titles. This is not going to be me eulogising Robert Kirkmans title, however - I do that enough elsewhere on this blog. 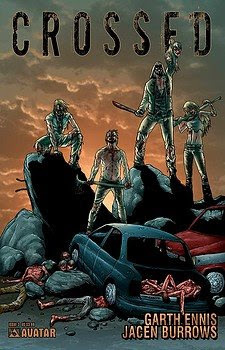 I think Crossed has a fear factor more intense than The Walking Dead, and there is a real intense feeling of all pervasive dread and terror that the more character driven Kirkman title cannot match generally speaking. There is an excellent review here that encapsulates my feelings about 'crossed' to a great extent. I will still be with it for #4. It still has its hooks in me.